The Finals are drawing nearer with every passing hour, but one cannot study all the time. And what can be more relaxing than compiling some random tables? 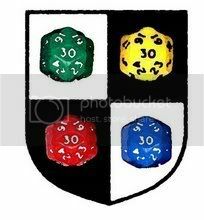 Recently I've read about the Order of the d30, and shot a look at the stuff involving this particular, a bit peculiar, die shape. As I am a proud owner of a d30, I've decided to come up with a d30 generator of my own design. 27. tries to sell the characters a red cloak that "gives the ability to fly"